Authorities identified the two adults found dead in a Barron County, Wisconsin home as 56-year-old James Closs and 46-year-old Denise Closs. The Barron County Sheriff's Office confirmed the identities in a release Monday night. According to the release, James and Denis Closs are the parents of 13-year-old Jayme Closs, who was reported missing. An Amber Alert was issued for Jayme Closs Monday afternoon. She is described as being 5-foot and 100 pounds, with strawberry blonde hair. Jayme is in eighth-grade. One of her best friends said Monday she's afraid for Jayme's life. "Let her go, she has a lot of people who love her and don't want anything bad to happen," said Ashlea, who doesn't want her last name used. According to the Barron County Sheriff's Office, deputies received a 911 call from a cell phone inside the home Monday at about 12:58 a.m. There was no communication with dispatchers, but background noise could be heard. Investigators are working to improve the recording and get a better sense of who made the call. Upon arrival, authorities found two adults who were pronounced dead at the scene. Sheriff Chris Fitzgerald said, "casings were found, we discovered the father first and the mother after that." Authorities learned the couple's only child, 13-year-old Jayme Closs, was missing from the residence. As they investigate the circumstances of the Closs's deaths, they consider Jayme's disappearance as an abduction. Sheriff Fitzgerald said police have not been called to the home before and Jayme had no known issues at middle school. Jim and Denise Closs had lived in Barron for as long as anyone can remember. They both worked at Jenny O. "The family was close, they did everything together and supported each other, "said a co-worker and longtime friend, who didn't want to be identified. Several Closs relatives said on the phone they weren't ready to make a comment yet, however one member replied, "this is hard, they are family." There are no suspect or vehicle descriptions as of Monday night. The Barron County Sheriff's Office, the FBI, Wisconsin state investigators along with the National Center for Missing and Exploited Children are working to find Jayme and probe the circumstances of her parent's death. Barron County Sheriff Chris Fitzgerald said he tried to issue an Amber Alert Monday morning to help find Jayme Closs but the case didn't meet the criteria. 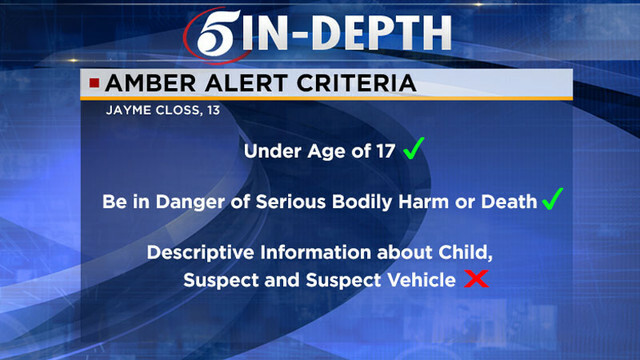 Below are the requirements for an Amber Alert to be broadcast in Wisconsin. The check marks indicate what was met in Jayme’s case. It’s unclear what changed Monday afternoon that allowed the Amber Alert to be issued without information on a suspect.